The book of Proverbs was written for two groups of people: those who know they need wisdom and those who don't know. Regardless of which category you fall into, the wisdom in Proverbs is as relevant today as ever and the road map to a blessed life is still the same: choose wisdom, follow God, and you'll be blessed. 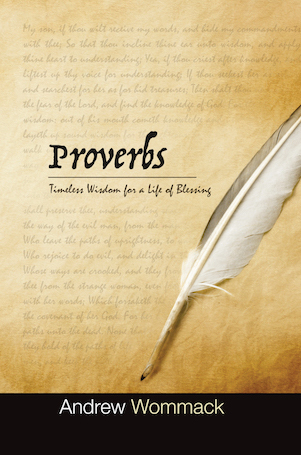 Proverbs: Timeless Wisdom for a Life of Blessing is an in-depth, verse-by-verse study of all thirty-one chapters in the book of Proverbs. With nearly thirty hours of commentary, this new teaching contains Andrew's personal insights into the principles and sound counsel found in Solomon's book of wisdom. This new book is part of two Proverbs Packages we've designed especially for gift-giving. 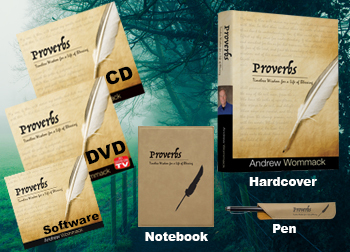 A Proverbs gift set will ensure that your loved ones receive all the wisdom they need for their lives of blessing! Why not pick up a package today for yourself and that special someone? A beautiful 800-page volume, the book format of Proverbs: Timeless Wisdom for a Life of Blessing includes notes from Andrew's Living Commentary, providing additional information and even greater insight into the rich treasury of Proverbs. All of this is possible through Andrew's partners who have been impacted by the message of God's love and grace, and are now sowing into this ministry so that we can continue to reach as far and deep as possible with the Gospel. 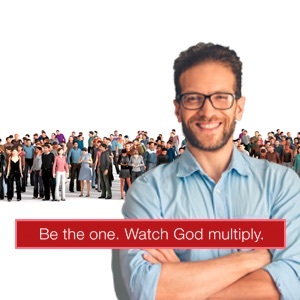 If you have been blessed by this ministry, consider becoming a Grace Partner today!